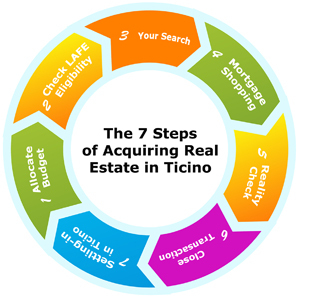 This site will help private individuals make the right decisions when relocating to or buying a holiday home in Ticino. It can be particularly challenging to purchase a property in a foreign country when not completely aware of the local customs and regulations. Furthermore how do you gather all relevant information on a property that you like to ensure that it is "safe" buy that you will thoroughly enjoy in the years to come? The "7 Step Process" will help make all the required arrangements and take the necessary precautions to make sure you successfully acquire a Swiss residence. Please navigate to the different steps through the menu bar at the top of the page. You can always return to this page by clicking on our logo. Everyone will want to have an exclusive residence, dominating one of the wonderful lakes and the Alps. In Ticino you can find the ultimate in luxury living with absolute unique views. 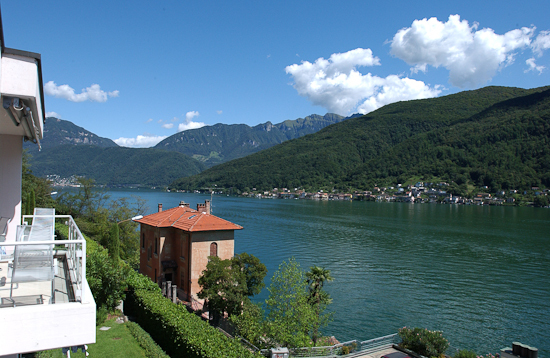 View from a luxury apartment in Morcote on the "Lago di Lugano"with a view of the "Monte Generoso", the highest mountain in the area, and the "Monte San Giorgio" that is listed as a UNESCO world heritage site due to its abundance of well-preserved reptile and fish fossils. Disclaimer: Every effort has been made to ensure that the information contained herein is correct and up-to-date. We can not accept any responsibility, legal or otherwise, for any inaccuracies, errors or omissions. The materials are provided for general information purposes only. Readers are encouraged to seek professional advice concerning specific matters before making any decision.